We’ve known since the beginning of the year that there’s going to, finally, be a new Ford Ranger coming to the U.S. market by 2019. The Ranger has been alive and well overseas, but that’s not the one that will be coming here. We’ll be getting an all-new Ranger, and, based on what we can tell from these spy photos, there will be a Raptor version of the Ranger as well. The Ranger is a smaller truck than the F-150, which should likely only help it in Raptorized form, though a modern mid-sized truck is still a pretty substantial beast. 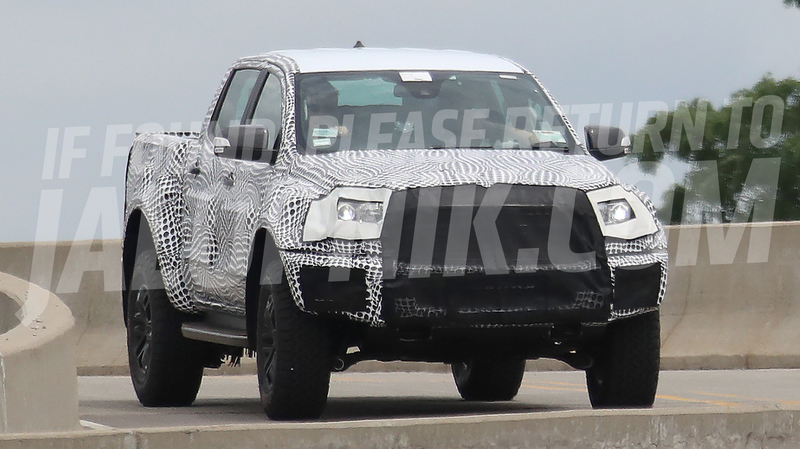 Though heavily disguised, you can easily see the massive fender flares, short overhangs, and what looks like a skid plate under there that gives away that this is likely the Raptor version of the Ranger. While we believe this is the U.S.-spec Ranger, it does seem to be right-hand-drive, suggesting that this version of the Ranger will make it to other markets, like Australia, that glorious RHD world where the Ranger is still sold. The Ranger Raptor is expected to have the 2.7-liter Ecoboost and 10-speed transmission from the F-150, which keeps it a notch below the F-150 Raptor’s 3.5-liter V6 Ecoboost. That 2.7-liter engine makes 325 horsepower in the F-150, but it may get a bump in Ranger Raptor context. The proportions look pretty good, but I’m eager to see it next to an F-150 to get a better sense of the size. It’s not yet known if the production version will offer the fetching op-art dot-spheres wrap as an option like this test truck is wearing, but I wouldn’t hold my breath.